Handcards are nice to prepare fibers for woolen spinning. Many companies make them and there are two basic kinds. The standard hand cards are great for medium wools that are not too long. Long fibers are more difficult to card and are more suited to combing. There are fine cards made for finer fibers such as cotton, silk and angora. Combs will give you a different preparation than cards will. Combing aligns the fibers and removes short bits and neps. Yarn from combed wool is less lofty and more durable than yarn from a carded preparation. I use the Mini Combs made by Alden Amos. They have two rows of teeth yet are light enough to be used easily. Stephenie Gaustad sent me these pictures, I am deep in her debt. These combs are amazing for fiber preparation but you've got to be very careful using them. The teeth are quite sharp and each comb has two rows. You'll also need something to actually spin your yarn. 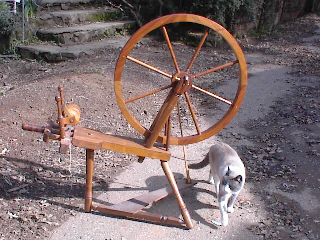 Many spinners start with drop spindles; these are generally less expensive than wheels and are certainly more portable. 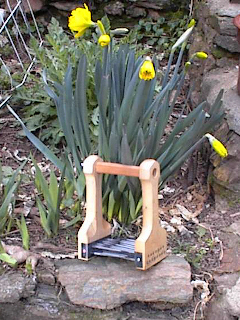 I use an Ashford Traditional wheel but I take my little spindles with me everywhere. I've spun in the doctor's office, at the harness races at Cal Expo and many other places. My little purple heart spindles are available from their maker Ray in Canada or from Detta's Spindle. These are superb spindles; they are well balanced and beautiful. My spinning wheel is the Ashford Traditional. I've added a jumbo flyer for plying and a high speed flyer for fine yarns and it does nearly everything I need it to do. This wheel looks a lot like mine. Some day, if I ever recover from my kids, I'd love to have an Alden Amos wheel. This picture is Stephenie Gaustad's own American Saxony; the fur person is Scut. Steph says about her wheel "For me, it is the combination of excellent performance and an appealing wood that makes this my choice wheel. I spin mostly fine yarns." It is gorgeous.